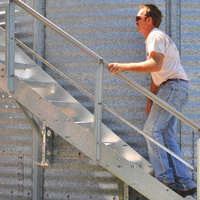 The Toolbox Assistive Technology Database Online is full of products that may assist farmers when an accident, injury, or illness makes doing farm tasks more difficult. It was also recently honored with a blue ribbon award in the American Society of Agricultural and Biological Engineers annual Educational Aids Competition. The Toolbox has been published in some form since 1986, but it wasn't until recently that it was available to anyone with an internet connection via the National AgrAbility website, www.agrability.org. Click here to read more about the history of The Toolbox. 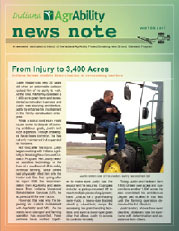 The News Note, the Indiana AgrAbility/Breaking New Ground quarterly newsletter, includes such features as client success stories, partner updates, special events, and assistive technology tips.